SilverDragon tracks rares. It will try everything possible to notice them and tell you about them. I, as its author, have precisely one quirk: I like a minimal starting experience. That means that *by default* SilverDragon doesn't know about any rare mobs, and will just learn about them when you encounter new ones. If you want more advance warning, just go to the "Mobs" section of SilverDragon's options and either enter a few mobs you want to look for, or click "import data" to pull in a complete list of every known rare mob and its locations. ## How does it search? Those little skull icons you see on the minimap. If one of them is a rare SilverDragon knows about, it'll yell at you. If you mouse over or target a rare mob, SilverDragon will notice it. This is the also how SilverDragon learns about *new* rares in the wild. After you first mouse over or target one, it'll remember it, and start watching for it in the cache in the future. If you have enemy nameplates turned on, SilverDragon will keep an eye on them to look for the names of known rares. This is the least exact method, because nameplates don't expose the underlying mob's id, so we have to rely on a plain name comparison. Addons that modify nameplates may interfere with this. SilverDragon can also create a macro to target any rares that are known in the current zone. You can stick this on your actionbars as a button to spam while chasing after a rare. This is sort of a last resort. ## How will I know when a rare is seen? When a rare appears, SilverDragon will pop up a frame that you can click on to target it. Warning: If you're in combat, secure action restrictions mean that it won't show up until combat finishes. 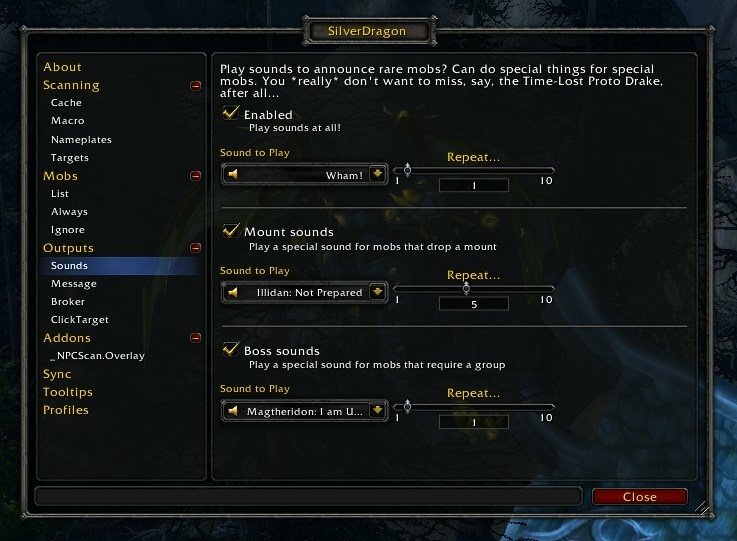 You can choose from assorted sounds to play when a rare is seen. The sound can loop for a while, to make sure you don't miss it. There's special settings for rares that drop mounts and world boss rares which you might want to call up a group for. If you're sitting mostly-AFK on a Time-Lost Proto Drake spawn, you probably want the sound that plays to be utterly ridiculous and go on for a good long while, to make *sure* you don't miss that sucker. In SilverDragon's options you'll find a "Mobs" section. In the "Always" section, you can add any mob you want to be scanned for. All you need to know is the mob id. 1. Go to his [wowhead page](http://www.wowhead.com/npc=8666/lil-timmy). 1. Grab his id from the URL. It's `8666`. 1. Enter `8666` into the "add" field, and click "okay". 1. Play with your new kitten. If there's some mob you don't want to hear about for whatever reason, just go to the "Ignore" section of the options. Again, enter the mob's id into the "add" box, then click okay. Bam! You will never again be told that Vern is up. You can turn this off completely, if you want to be private about it. Some rares are part of an achievement. When you mouse over a rare mob, SilverDragon will add to the tooltip whether you've already killed it, so you know whether you need to rush for it. SilverDragon includes a Broker plugin. It'll attach itself to your minimap, or a Broker container you have installed, and show you a list of the mobs it knows about in the current zone. You can clear the mob cache by quitting WoW and deleting creaturecache.wdb from the `Cache\WDB\enUS` (or your actual locale) sub-directory in your WoW directory. * [ServerRestartSound](http://www.curse.com/addons/wow/serverrestartsound): plays a sound when the server's about to restart. If you're AFK-camping for a rare spawn, you probably want to know about this. 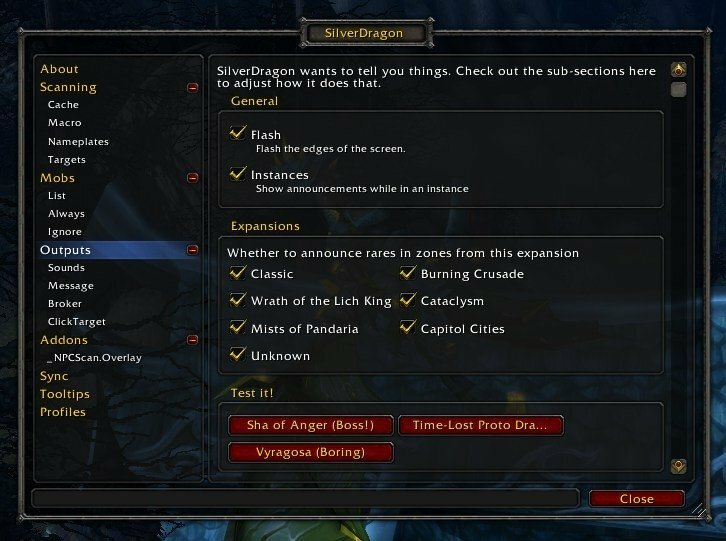 * [HandyNotes](http://www.curse.com/addons/wow/handynotes): integrates with SilverDragon to show icons on zone maps where a rare has been seen. * [_NPCScan.Overlay](http://www.curse.com/addons/wow/npcscan-overlay): shows rare mob paths for some rares, and can be told to pop up if SilverDragon sees something. * [ChocolateBar](http://www.curse.com/addons/wow/chocolatebar): a broker display. SilverDragon's minimap icon will show up on it (or any other addon like it) instead of cluttering up your minimap, if you have it installed. ## Why should I use this instead of _NPCScan? _NPCScan is all about scanning the cache. If a mob winds up already in your cache, it'll do nothing at all to help you. SilverDragon tries to fall back on more things, to give you the best chance of finding rares. If you want to run across rares while leveling, SilverDragon helps with that. _NPCScan is solely a max-level tool. ## What's new with version 3? Most of the addon has been rewritten so that its internals are entirely based on mob ids and zone ids, neither of which were available to the client back when 2.0 was written back in early 2009. This was also a great opportunity to stop having to lug so much localization code around. Extend the range of vignettes on your minimap, so we don't keep on alerting for things without giving you any clue as to where they are. Vignettes with different names from their associated mob should now be detected on non-English locales. You Won't Believe This One Simple Trick To Increase Vignette Detection Range! ...stupid typo in the TOC broke everything. Some map function related issues in BfA. Added some fallbacks for mob-names so it's less likely you'll see "Unknown"
The wrong Gorok had been included for ages, in Warlords. Sorry, Horde garrison havers. Click target sometimes said a mob's name was "0"
Stop the popup from showing for Haakun the All-Consuming, since it reliably crashes the game. For reals. Improve vignette scanning to compensate. 6.0 should have made it more reliable. Add a toggle for the frame locking... apparently the ALT-drag thing was non-obvious. Strip out (Jade) from syncs. Rewritten extensively to better handle the new mob/zone information that's been made available since early 2009. Some people reported an error when the screen flashed to alert them of a rare. This should plausibly be fixed... though I could never actually reproduce it myself, so no promises yet. New "clear all rares" option in config. HandyNotes updates in response to import/clear without needing a reloadui. Actually includes the non-vern dataminer run. Run dataminer. Forcibly exclude Vern from the dump. So if you clear your seen-rares and then do a new import, you won't see the popup for Vern in Dalaran any more. Add zhTW rares translation submitted by s8095324. Default rare list localized to: deDE, frFR, ruRU, esES. Run an import to pick 'em up. Better filtering-out of player pets. Bump the TOC for SilverDragon_Data, so you don't need to enable out of date addons to import rares any more. Different layouts for portrait and full-body model views. Full-body is big and on top of the frame. AceConsole-3.0 embed was missing. Oops. Adjust said targeting frame a bit. Fix a bunch of errors I found when looking at the Scarshield Quartermaster. More feedback when creating a macro. Show in the tooltip whether a mob is already in the unit cache. Option to choose what ways of seeing a rare will make the targeting frame appear. Add click-to-target frame that pops up when a rare is seen. Options for which scanning methods to use. Add cache-scanning, much credit to NPCScan by Saiket. More options for notifying you: text, sound, screen-flashing. LDB tooltip now says whether the rare is tameable. For the cache-scanning to work, you have to import data. It relies on NPC ids that can't be gained from within the game. Add a minimap icon for those without. Fix a missing LibSink-2.0 embed. Total rewrite for WotLK. It's Ace3 now, and works with HandyNotes or Cartographer to put notes on your map. Some distance tweaks to rare location saving. Add zhTW translation from norova. Fix a few potential bugs. Add TBC rares to defaults, provided by Astaldo on wowace forums. Adjust display of coordinates to "x.x,y.y" instead of "x,y". Better Cartographer information -- show rare info in the Cartographer tooltip. Tweaked nameplate scanning for efficiency. Greetings! I just added SilverDragon to my WoW account, and am really excited about it! Normally I do not use ANY sound when playing. What sound must I enable for SilverDragon to notify me of a rare sighting? So I went into the interface, then mobs, then the warlords tab. How do I get that list to only show the ones I have checked,or to be able to scroll done the list to see the whole list ( prefer to show only the ones I have checked)? Updating from a pre-8.0 version last night reset several of not all of the addon's options, was that intended? Last edited by Nathanyel : 07-19-18 at 01:00 AM. *sigh* why don't they continue? Thank you so much for updating here, in addition to Curse. Last edited by Comicus : 10-12-15 at 03:55 AM. I downloaded this today, and the filename (at least) has the same number as the version I already have - 3.0.10. What am I doing wrong? I love the addon for finding mobs, but... My character icon, in the center of the minimap, is covered with a dragon image, and makes it impossible to see if I'm facing north or south. Is there an option to hide this, or some other way to disable it? I'm not talking about the minimap button, on the side of the frame that I find useful. But the character icon in the middle of the minimap frame. I have looked on the addons options but there is no way of hiding the minimap button how can i dot it? Had to hunt around for it. Go to Broker section, and you will see it as an option. Just my opinion, but every addon should have a general section where HIDE MINIMAP ICON is one of the basics tickboxes. It's different in almost every addon... aka, annoying. But I'm thankful for the addon in general. Re: Re: How to fix rare mob names in English? Thanks! It's working for all Pandaria Mobs I found so far. Re: How to fix rare mob names in English? Hi! I used SilverDragon for a loooong time and deleted the raremob database yesterday. Then I clicked the Import rare mob and import Achievement mob buttons but now all found (cache) rares show an english name in the popup to target them and a click can't target them because they have German names. Does anyone know how to fix this? It worked great with the German mob names in the past. The mining of non-English names ran into problems. As of the just-uploaded 3.0.5 version, for the achievement mobs, it's not actually so bad -- next time you log into the game after it'll pick them up by grabbing the names from the achievement itself. How to fix rare mob names in English? Last edited by Bl4ckSh33p : 03-17-13 at 02:24 AM.